Overall crime numbers were fairly normal this month. There was a small uptick in car break-ins, but nothing trend worthy. These were mostly spread out across the neighborhood in time and place. There were only 2 home break-ins this month, which is way below normal. Several of you emailed me about the WFAA report on robberies in the area. 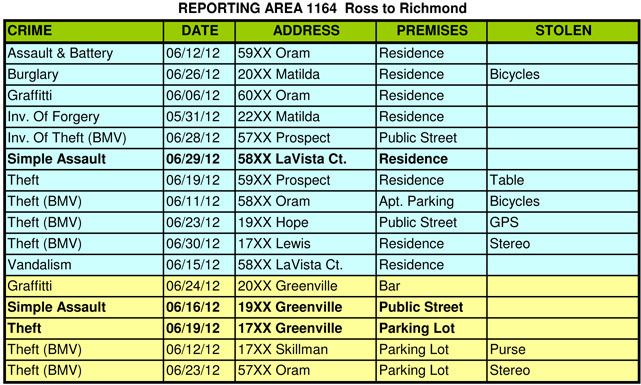 In last month’s report I had already mentioned two robberies which occured in the area in the first part of June. The one on Belmont is in the report below. This one involved known parties in a dispute and an arrest was made. Since then, there were three others. The first (on Goodwin) again involved a robbery that occurred among parties known to each other. A dispute fueled by alcohol escalated to the robbery event. The second event occurred on Greenville, but had actually started near the DART rail station at Mockingbird Station. A man was walking home from the DART station in the late evening and noticed he was being followed as he passed Burger Street. When he crossed Mockingbird, the suspects asked to see his DART day pass. When he grabbed for his wallet, he was punched in the head and had his belongings snatched. In a third event, just outside our boundaries, two people were robbed at gunpoint, just off Greenville at Bell Ave around midnight. The suspects were described as two black males about 20yrs old. One of them was said to be about 5’7″, 170 lbs. No other description was available. With all the unfortunate damage we got in the most recent hail storm, a huge number of our residents will be getting new a new roof. This means that likely hundreds of construction workers will be in the area for the next couple of months. Unfortunately, experience has shown us that when there are a lot of contractors in the area, crime goes up. This is not to cast dispersions on contractors in general, but criminals tend to follow. Sometimes they are looking to steal tools or they might think that the residents are staying elsewhere while the work is being done. Most of these crews include day labor or other transient workers who chase storms to do this type of work. In any event, please on high alert for the next couple months while these crews are here by ensuring that your home is well lit in the evening and doors are kept locked at all times. And please continue to report suspicious persons to 911. LGNA Board Member Philip Kingston has put together an article on this topic. You can read it on this website.